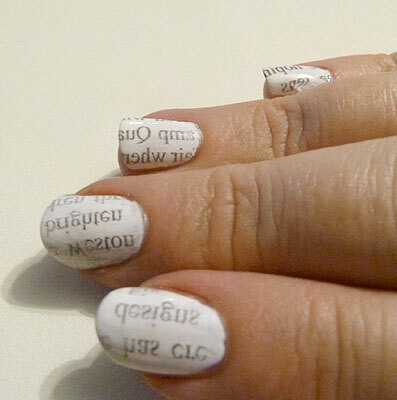 My friend Cindy introduced me to wordy nails — which are the perfect 'accessory' for me! 1. First of all, shape and paint your nails as usual. Allow the polish to dry. 2. Tear up the newsprint into small strips. 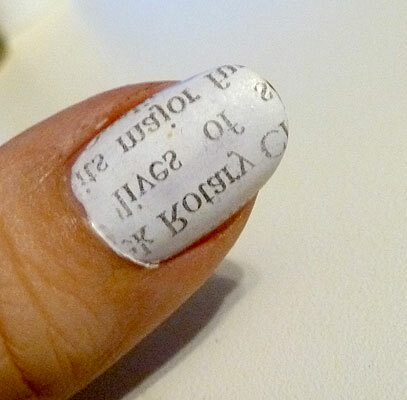 Think about which direction you want the text to run on your nail (along, across, random?). Then pour a little of your alcohol source into the little cup. 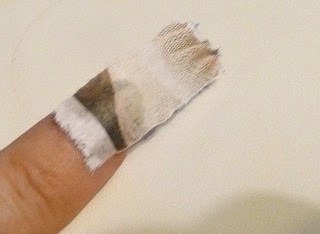 Dip your fingertip in, getting the nail completely wet. 3. 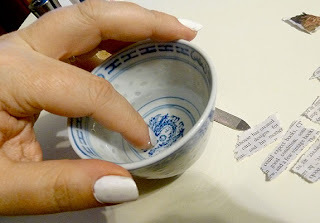 Press a piece of newspaper onto the nail, and press down firmly for a few seconds. 4. Lift off the paper, and — voila! 5. Coat your nails with the clear varnish, to protect the lettering. 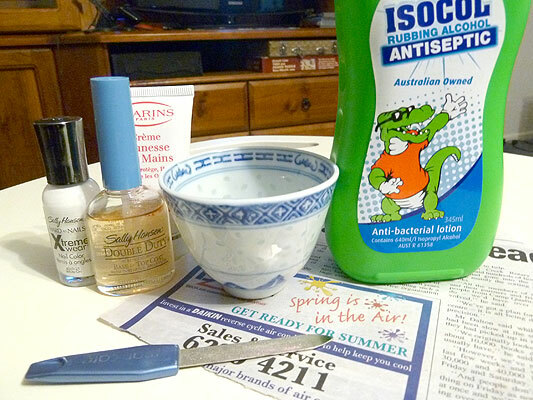 Once the top coat is dry, wash your fingers (you'll probably have newsprint on your skin around your nails, too). Because this is a printing method, the lettering will be reversed. Don't limit yourself to words, you could use stock reports to get reversed numbers, or comic strips, or ads ... I'm going to try the puzzle pages, of course! 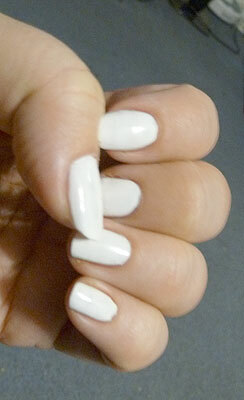 It is very cool, if only I didn't break my nails with such frequency. I have two nails long enough to do this with. I could use the comics and have Prince Valiant wrapped around my little finger! Time to buy some white polish. have you been out in the sun too long. That is so perfect for you! Teeny tiny crosswords would be so cool. I have those same little rice porcelain teacups!